After going to see my dad in the Memorial Day Parade, it was a good day for getting things done around the yard and in the house. That included grocery shopping and cooking. Jon was in the mood for shrimp tonight, and since I won't touch the stuff, I decided to make risotto to go along with it. - I roasted bite sized pieces of asparagus tossed in olive oil for about 12 minutes on 400 degrees, and added them to the risotto at the end. - I also roasted a bulb of garlic this afternoon, chopped up every clove, and added it to the risotto about 3-4 minutes before it was done. Jon makes the most delicious looking shrimp - I wish I ate it! They smelled great and looked beautiful. The best part is that he sings while he's cooking it!! Sometimes it is "shrimpy shrimp shrimp shrimp" and other times it is "Cockroach of the sea" in a very deep voice. He cracks me up. 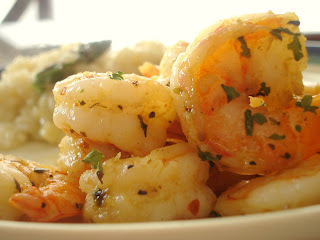 He took 3/4 of a pound of 26-30 count clean, raw shrimp and sauteed them in a pan with olive oil, 3 cloves crushed garlic, oregano, coriander, dried basil, freshly ground black pepper, and red pepper flakes. They only took about 4 minutes to cook, and at the end he added some dried parsley. Look how beautiful they are!! 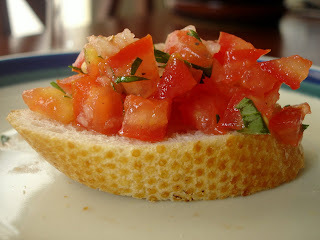 I also made some fresh tomato bruschetta (bruschetta is actually a bread with a topping - a lot of people call the tomato mixture bruschetta, but that is not correct). I took 3 vine ripened tomatoes, about 1/4 of a small onion, 2 cloves minced garlic, 5 leaves of fresh basil from my herb garden, about 1 tablespoon of olive oil, and mixed them all together. When we were ready to eat, I toasted 6 slices of toasted baguette rubbed with garlic in the oven for just a few minutes. So good and fresh!!! I think it's really cool you have recipes on here!